I’d like to start out by thanking all of my readers for a fantastic two years! Without you, this would be my diary. I am very lucky to have all of the support that I do and am excited to see what the future will bring in blogland. View my 1 Year Blogiversary Post here! I feel like I haven’t been blogging for that long. Every time I think about the blog there I can see that there is so much room to grow and so many things I still need to learn. Despite some days feeling like I am at the beginning of my blogging adventure, a lot of the blogging experience has become second nature. I am proud to say that I have made it to the two year mark and am still just as in love with blogging as I was when I first started! I started this blog because I needed a hobby. Since creating the blog, I’ve had not only this hobby, but I’ve gained other hobbies that I also like to blog about. Some of those hobbies include cooking, gardening, and DIYing around the house. I’ve of course always loved these things but I now love them even more because I can do them and blog about them! I had a ton of changes in my personal life during year 2 of blogging. So much that had I not created the blog when I did, I’m not sure it would have gotten created. When I created the blog I was in a stable environment doing the same thing I’d been doing for over a year with not many moving parts. I’m very happy that I did create the blog though because it has been an outlet for me to be able to enjoy myself even during busy times. I got engaged and married! – I never really posted about my personal life on the blog, but this year I had exciting news so you all got to learn a bit more about me. I sold my house! – As many of you know, my house was my favorite place to be. I had done so many projects around the house that made the house feel just the way I wanted it to. Well, this year, I ended up selling the house after being there for 4 years. I hadn’t planned to sell it but Nick and I found our dream house! We built our home! – Yes! Nick and I signed on our new house last September and moved in in June. We love this home even more than the last and are very excited to finally be setting in! With all that happened this year, I’m impressed that I was able to keep the blog going. I did cut down quite a bit over the last three to four months but I’m still seeing growth! Most notably, this year I doubled my social following! I had projected to grow the following even larger but the break that I took really showed in the last handful of months where you can see minimal growth. Regardless, I am very pleased with these results and am so excited to see what next year’s chart will look like! I don’t know about you but I do not see any trends in income! It seems to be all over the place. I did notice that towards the last quarter of 2016 I was receiving Linquia campaigns. I haven’t had any of these since 2016. I will look more into this later this year. It just worked out that I was too busy to take on any campaigns anyways. 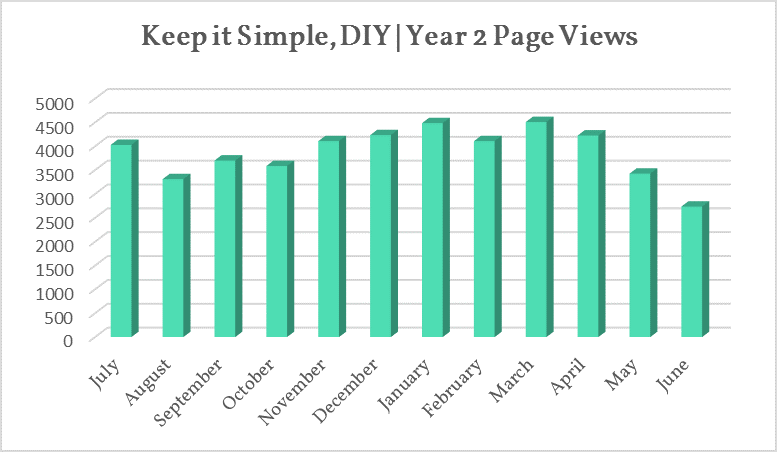 I did see some pretty good growth from having an average pageviews in the lower 2000-3000 range at the end of year 1. 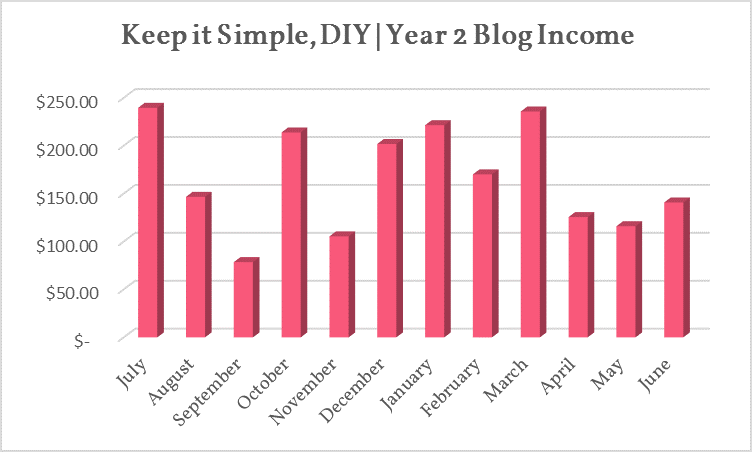 At the beginning of year two this average jumped into the 3000’s and then into the 4000’s by the middle of the blog year. I did see quite the drop in page views this summer but I also put in minimal effort. And by minimal effort I mean I didn’t even share to Pinterest during these months. The following graphs are what I use to try to keep myself growing. Each chart shows a trend line (the pink line) and my actual stats (the teal line). The trend line extends six months past my data to give me a prediction of where I will be each month for the next six months. This of course is dependent on the amount of effort I put into the blog. 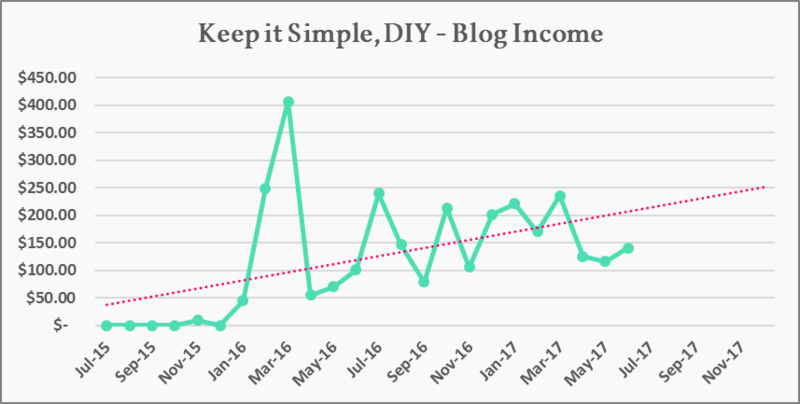 All three of the graphs clearly show the break I took from blogging over the last three months (note that the teal line is quite below the pink line). I expect that over the next few months, the teal line will begin to move back up towards the pink lines. The trend line I’ve used for followers is an exponential trend. For a while, My followers were following the curve perfectly. 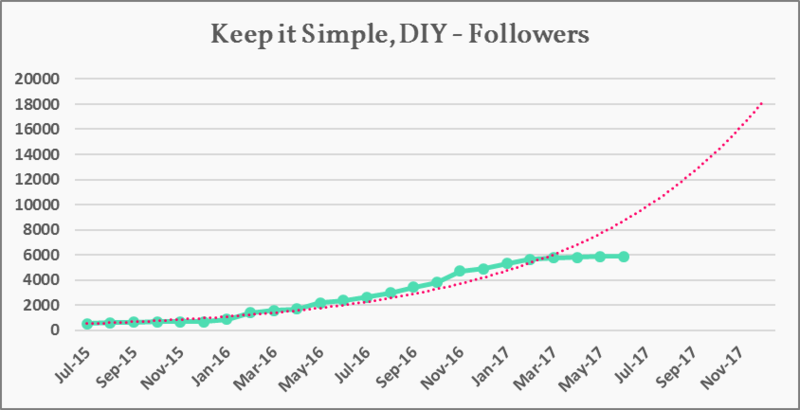 Looking at the prediction of 18,000 followers, I may need to re-adjust this trend line to be linear. While 18,000 followers would be amazing, it seems like it may be a bit far fetched. The next two graphs show a linear trend line. Again, you can note the break I took over the last few months by the dip in the teal lines. My laundry post was featured on Buzz Feed! Received my first, second, and third Linquia campaign. Joined 30 Pinterest groups and started using Tailwind. Year 3, here I come! How fun to do a year of review! A great way to capture your growth and how far you’ve come! Great idea and congrats on yiur 2 years! 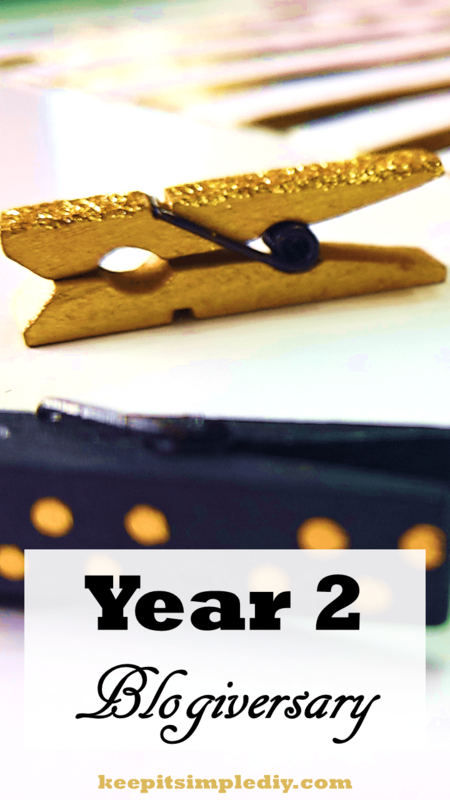 Congrats on your 2nd blogiversary and all your blogging achievements! Well done! Congrats on your 2nd anniversary and the steady income you’ve generated. Great work! A lot of great accomplishments in your life, congrats! Awesome site too, very clean layout! Congrats! Thanks for sharing your stats and everything, it’s really inspiring to see how much great blogs can grow! Congrats on two years! I am at a little over 2 1/2 years myself. 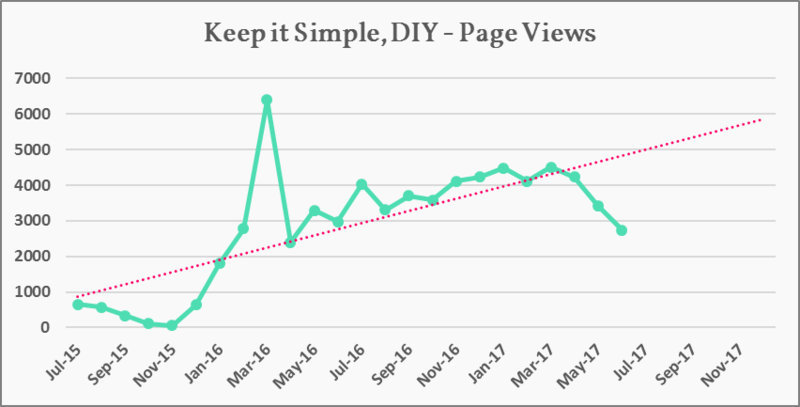 It’s fun to look at blog growth and feel a sense of accomplishment!